Arlington officials expect as many as 3,000 more people will be able to earn health insurance through the Medicaid expansion passed by state lawmakers this year — and now the county needs new staffers to sort through the paperwork. 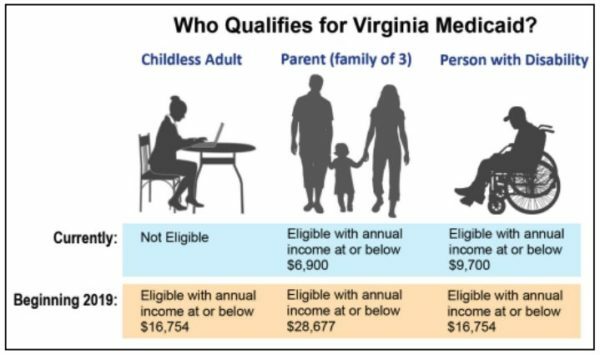 The County Board could soon accept just over $277,000 in state funds to hire six new workers to process Medicaid eligibility applications, anticipating that Arlington will see up to 7,000 requests for coverage through the program when changes officially take effect next year. The General Assembly approved the expansion this spring, after Democrats’ sweeping gains in the legislature set the stage for a compromise on an issue that had long roiled state politics. Now, Arlington and other localities around the state are preparing for an influx of applications from low-income and disabled workers looking to earn healthcare coverage under the program for the first time. Starting Jan. 1, 2019, Medicaid benefits will be available for childless, able-bodied adults for the first time, so long as they earn no more than $16,754 a year. The income cap will be raised to the same level for adults with disabilities, up from $9,700 a year, while income limits will also be bumped up for families with anywhere from three to eight children. Under those new standards, county officials project at least 2,904 additional people in Arlington will be eligible for the program, and staff fully expects that evaluating the incoming flow of applications will overwhelm county workers. While income is one measure Medicaid officials will examine in determining if someone is eligible for benefits, the program will also require many recipients to hold down a job — Republicans insisted on including the work requirements as a condition for approving the plan, though it will likely entail complex reporting requirements. Accordingly, hiring six new staffers would help the county better distribute work among its employees and “contribute to reducing the error rate and processing time for application and recertification processing,” staff wrote in a report prepared for the Board. In all, the county expects to spend about $527,000 annually to afford those staffers moving forward, with the state covering just over half that amount. Staff are hoping to pay for the remaining $249,000 or so with its own money, then evaluate in future budget years if the county needs to maintain those positions. The Board is set to sign off on the new hires at its meeting Saturday (Sept. 22).